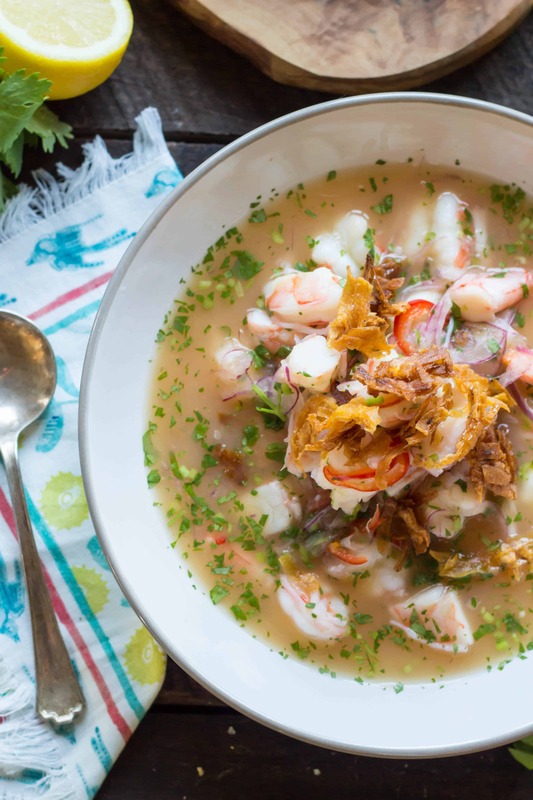 This recipe for Ecuadorian shrimp ceviche is different than Peruvian ceviche in that it has more liquid, like a cold soup. It’s light, tangy, gluten free, and perfect for eating on the beach! 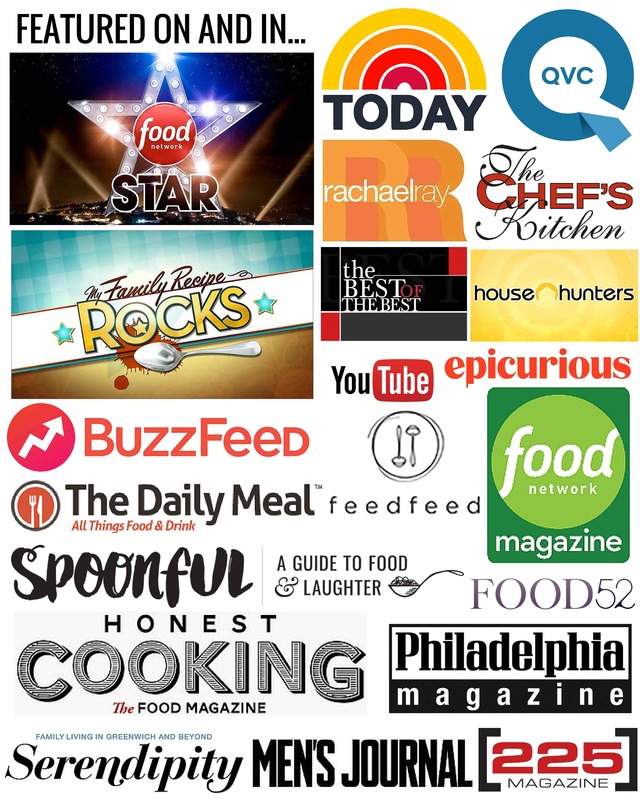 I’m super lucky to have lots of friends from a slew of different cultural backgrounds, because they’re always opening my eyes, and my taste buds, to all sorts of new and interesting foods. I met my friend Veronica many years back when she first moved to America, from her native Ecuador, to marry her love, Jesse, who happens to be one of Chaser’s oldest and closest friends. The two of them have moved back and forth from New Jersey to Ecuador to Philly to New Jersey again, then back to Ecuador, and finally, have settled down in Delaware with their absurdly adorable new baby, Oliver. One time, fairly early on in our friendship, Jesse and Vero invited Chaser and me over for a traditional Ecuadorian dinner. I couldn’t even tell you what else was served that night because I couldn’t stop gushing over the first course, shrimp ceviche. I’m pretty sure I asked for seconds and then proceeded to lick the bowl. It was, without question, the best tasting ceviche I’d ever had, but it was also completely different from any other ceviche I’d ever had. That’s because, as Vero explained, this was Ecuadorian style ceviche, and therefore different from it’s more well known Peruvian counterpart. 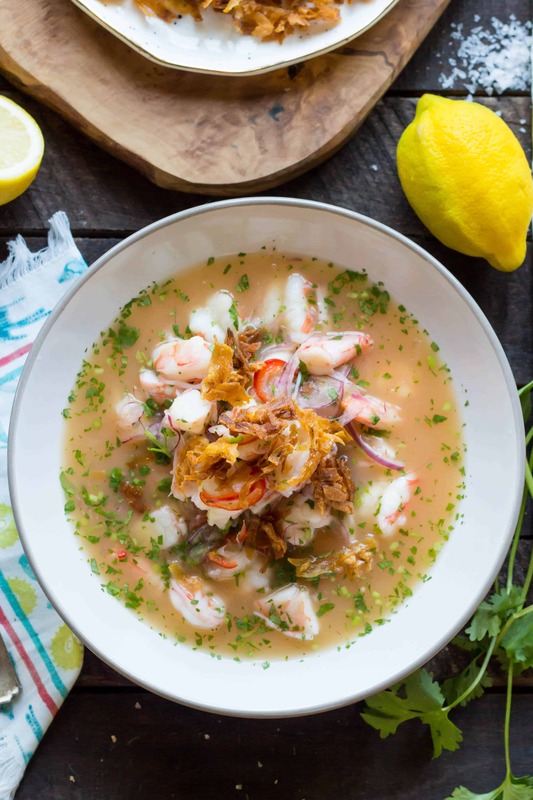 What makes Vero’s ceviche different from others is the consistency. A lot of ceviches are thick, without a lot of liquid, and are served with chips to scoop it up like a seafood salsa. This version is more akin to a cold soup. It’s meant to be very brothy, served ice cold and slurped up with a spoon. I challenge you to find something that’s more refreshing to eat on a hot afternoon, like, well, today. Usually by this time in the year, the heat and humidity have significantly dropped, but currently, the weather feels more like the middle of July than the middle of September. Personally, I’m not mad about it. 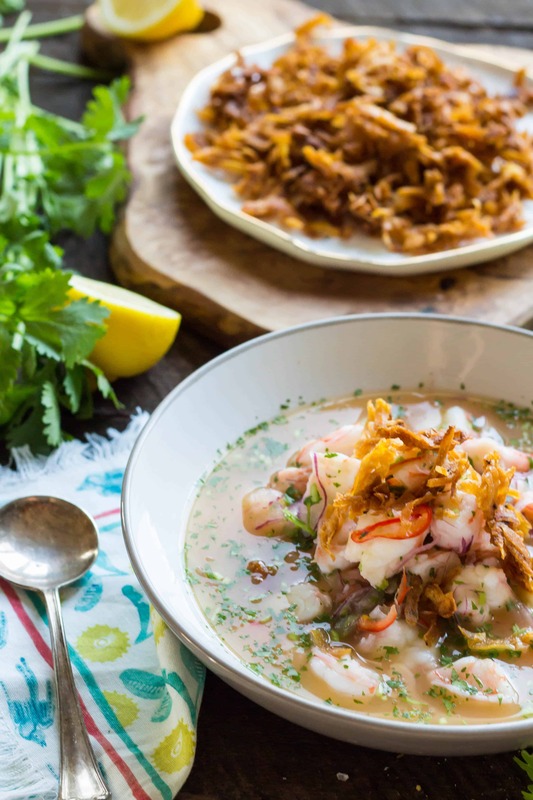 Ceviche is typically known as being a raw, or raw-ish preparation of seafood that gets “cooked,” or more accurately, cured, by the acids present in citrus juice. This version differs in that the shrimp are first boiled, and then tossed with the citrus and other flavorings. Cooking the shrimp first ensures that they’re safe to eat, and also gives them that irresistible snappy texture that you just wouldn’t get from marinating alone. The broth is very simple but still complex in flavor. I often associate lime with ceviche, so I was surprised when Vero gave me the recipe and there was no lime in sight. Instead, it uses lemon and orange juice, in addition to one very surprising ingredient: ketchup. It adds a hint of sweetness and body to the liquid. You’d never know it’s in there, but leave it out and you’ll wonder what’s missing. 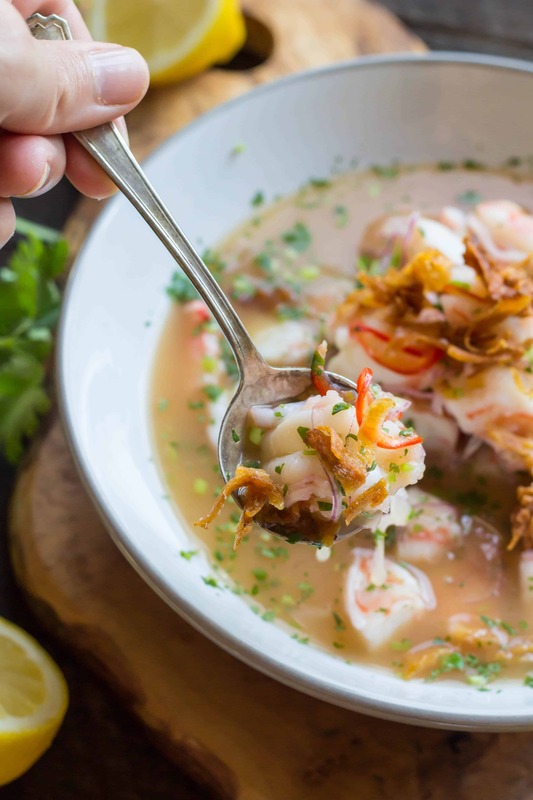 The broth is further enriched by the very liquid in which the shrimp are cooked. The poaching liquid has lots of flavor, especially if cooked with their shells, and serves to both mellow out and stretch the citrus broth. I found this also to be a surprising addition to the recipe, but when I tried it without the poaching liquid, it just tasted off. As for toppings, something crunchy is essential. I’m partial to the fried plantains, as it was how Vero first served this to us, but corn nuts and even popcorn are traditional as well. 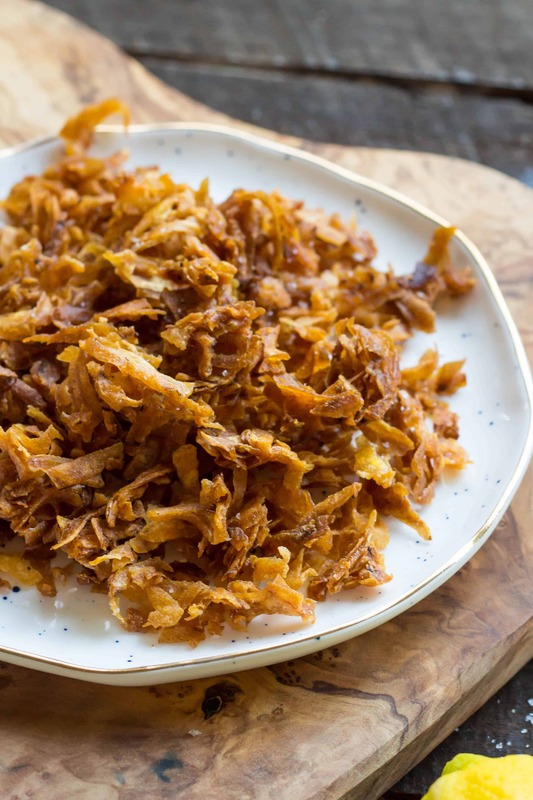 I love the little crispy bits of these homemade fried plantains, but we take the lazy way out more often than not and use store-bought plantain chips instead. All summer long we make up big batches of this stuff and bring it to the beach in a thermos. We dish it out into plastic cups and always top them with crushed up store-bought plantain chips, because who has time to fry their own plantains before a day the beach? Not this girl. Luckily, the ceviche itself is best made the night before, so it can marinate and get nice and chilled in the refrigerator while you sleep. Sometimes we serve it with a spoon, but mostly we just throw them back like shooters. It’s the beach snack of choice in Ecuador, and it’s become our beach snack of choice here in Brigantine now, too. Place the onions, chile pepper and lemon juice in a large mixing bowl and set aside to marinate. Bring a medium pot of water up to a boil, add the shrimp, and cook until just opaque, about 3 minutes. While the shrimp cook, prepare an ice bath, then immediately shock the shrimp in the ice water to stop the cooking. Add the reserved shells and tails to the water, turn off the heat, and allow them to steep. Drain the shrimp, pat them dry, then slice into bite sized pieces. Add to the bowl with the onions, chiles and lemon juice, mix, then let marinate for about 15 minutes in the refrigerator. Leave the shrimp shells soaking in the water while it cools. When the water is no longer screaming hot, strain out the shells and add 3 cups of the poaching liquid to the shrimp, along with the ketchup, orange juice, salt, cilantro and stir until thoroughly combined. Taste for seasoning and adjust as needed. Cover and allow to chill at in the refrigerator for at least 30 minutes, but overnight is best. When ready to serve, heat about 1 inch of oil in a heavy bottomed pan or a deep fryer to 375 degrees. Use the large holes of a box grater to coarsely grate the plantains. Working in batches, drop the grated plantains into the hot oil, and cook, stirring occasionally until golden brown and crisp. Remove with a slotted spoon and place on paper towels to drain. Sprinkle with salt, then repeat with the remaining plantains. 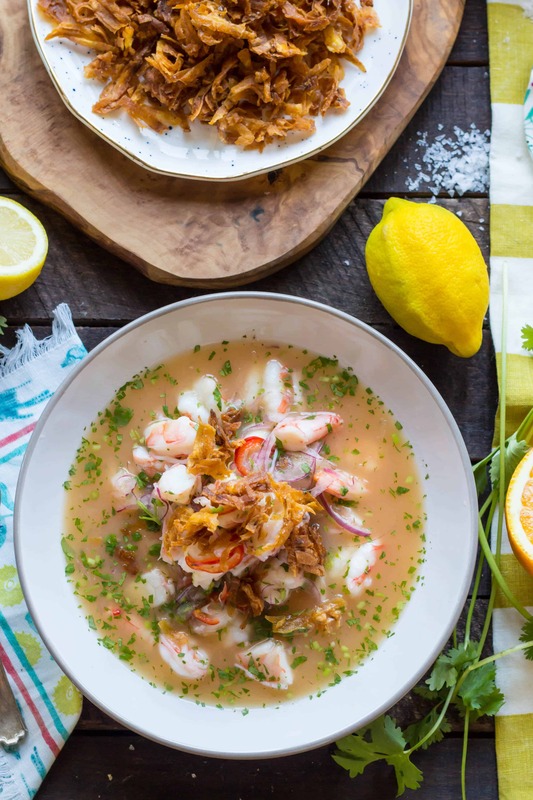 To serve, ladle the ceviche into bowls, being sure to include plenty of liquid. Sprinkle with fried plantains and serve ice cold, with the remaining plantains on the side. Store bought plantain chips can be substituted for the fried plantains in a pinch. You can also serve with popcorn or corn nuts for a unique and traditional version. Coley that looks divine! We had ceviche for dinner tonight at a new Peruvian restaurant. So disappointing! Super salty and the fish was mediocre. I need to make this lovely Ecuadorian version to erase it from my palate. I love that you bring this to the beach! That, with a side of cold mango… aaaaaahhhh. Oh man, that’s such a bummer!! People are always stoked when I show up to the beach with ceviche, but I have to tell you, your mangoes were equally as popular!! Thanks for this easy-to-follow recipe. 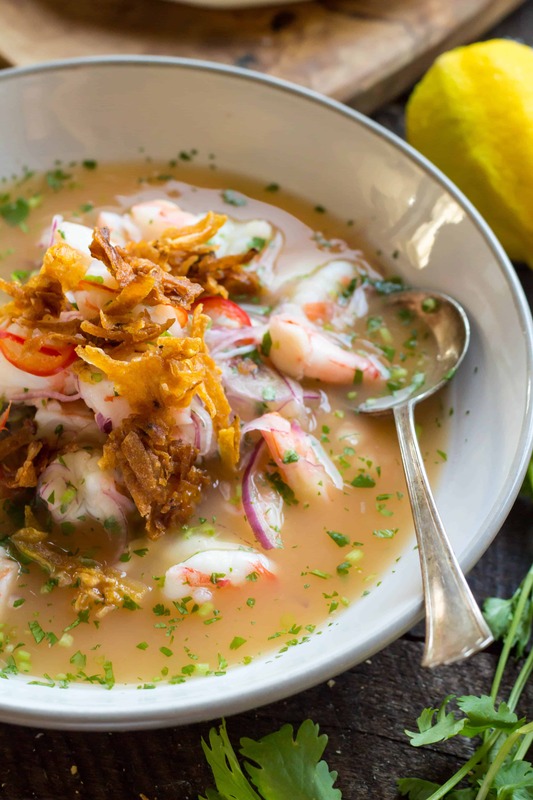 I grew up in Ecuador and so ceviche is one of my favorite comfort foods. I’ve never seen the grated version of the platano chips. It’s a nice twist on the chifle. I’ll have to try it.